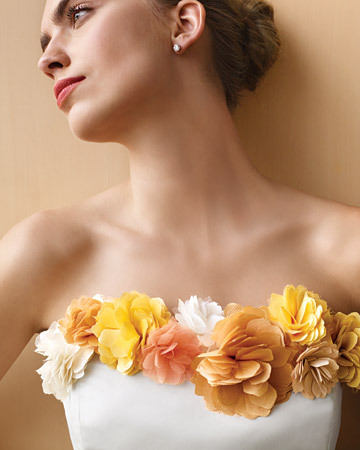 Fabric and paper flowers are so elegant. Whether on a boutonniere or in your hair. A long time ago I made about 30 or 40 tissue paper flowers for Lily's first birthday. I gave them to all the girls who wore them in their hair. So classy. I wish I had a photo to share with you but I'd have to dig through my old cds. Martha Stewart has some really fantastic paper and fabric tutorials that would work for any party, wedding or everyday extra touch to your outfit. what kind of fabric would you use for those dahlia/peony fabric flowers? the tutorial does not say. gorgeous though, i want to make them for my girlfriends for christmas! I would use some kind of chiffon. Nylon chiffon would be best because it doesn't fray but it's hard to find. If you use some kind of chiffon or chiffon like material I would spray it thoroughly with no fray spray. I bought mine at Hancock Fabric. It was the only place that sold it so I would call ahead so that you're not running all over the place.